High above the small market community Reutte in the Tyrolean Außerfern, you can find the Ehrenberg Castle, a real cultural highlight. Along with the baroque fortress Schlosskopf, which towers above the castle, the Ehrenberg Defile in the valley, and the fortress building „Fort Claudia“, the castle ruin Ehrenberg belongs to one of the most important fortress ensembles in Central Europe. 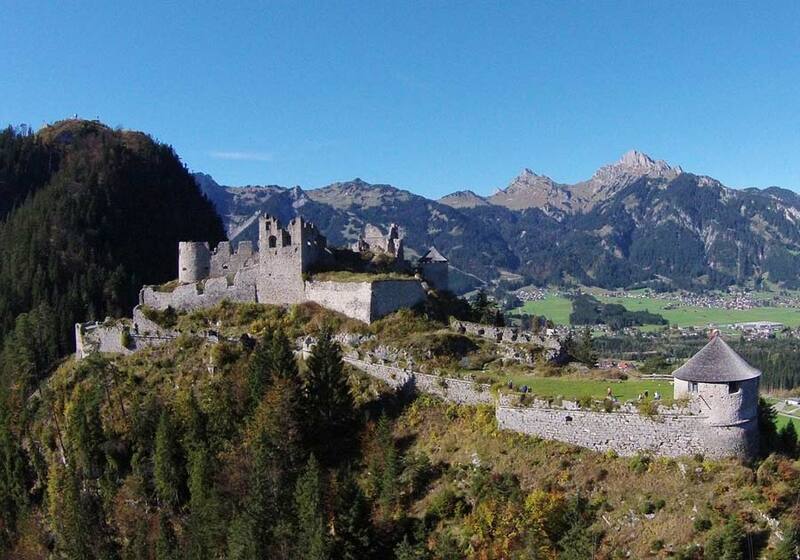 The castle was built around 1290 when Count Meinard II, who at that time held the governing rights for the area around Reutte, required a new fortress. In the year of 1639 Fort Claudia was built. In 1703, Ehrenberg was conquered for a short time by the Bavarian Elector during the Spanish succession war, before the Tyroleans managed to reconquer it. During the combat procedures, the castle was once again damaged. After that, the fortification system somehow slipped into insignificance and was sold as a stone quarry. One industrialist from Reutte purchased the ruin in the mid-19th century and one more century later, restoration works began. Following the will of the current owners, the castle should remain a place of serenity for the people, as well as a sight for tourists. And tourists do come in great numbers and are often quite impressed by the magnificent castle ensemble Ehrenberg and the beautiful surrounding nature. The main building is nowadays a part of the European Castle Museum. At the end of July it's time – Europe's biggest historic event of its kind, „Knights' Games Ehrenberg – A travel through time“ - Roman & Knights' Games – opens its gates and invites thousands of visitors to Reutte/Tyrol. Experience knight tournaments, gladiator games, a huge medieval market, the battle of Ehrenberg, fireworks, concerts and much more.